Find out about LTYC's work in 2017-18! See how we made impact in the 2016-2017 school year! Read about the results from the 2015-2016 year here! LTYC programs encourage higher self-esteem and self-worth in students. Within a safe and stimulating environment, students are able to reflect on their processes to identify their strengths and weaknesses, and they are encouraged to apply areas of growth, such as work habits, creativity, and effort, to successfully undertaking future projects. Instructors can assess students’ process with emphasis given to work habits, creativity, and overall effort. Not only can they review progress in each discipline as a general scoring tool for all LTYC classes, instructors may also create a more specific rubric to assess a particular project students are working on in class. Parents love seeing the growth that occurs in their children who participate in Leaders of Tomorrow Youth Center. Just as importantly, they can be directly involved in their children’s success through the Parent Empowerment Team Program (PET). PET encourages parents to stay involved in every aspect of their children’s learning. 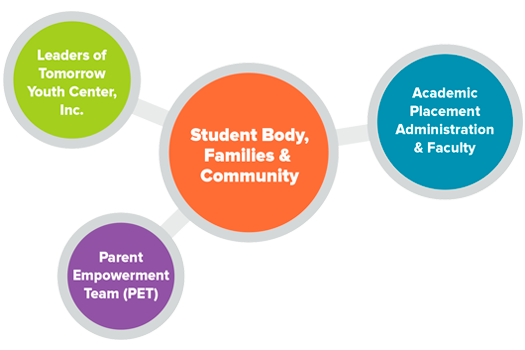 It allows parents to better understand the systems that govern their child's school district and their child’s education. Finally, utilizing a clinical approach, PET helps parents bridge the communication gap between themselves and their children with the goal of creating stronger families.